For the fifth year in a row the NYRR have invited the top two Japanese university finishers at November's Ageo City Half Marathon to make their U.S. debuts at the United Airlines NYC Half. Last year in Ageo Kenya Sonota and Yusuke Nishiyama from four-time National University Ekiden champion Komazawa University went 1-2 in 1:02:48 and 1:02:52 to seal up their invites to New York, just outkicking Japan's best first-year Haruki Minatoya of Tokai University. Three weeks ago Sonota sustained an injury that forced him to withdraw. 19-year-old Minatoya, already entered for the National University Half Marathon, was ready to take over. 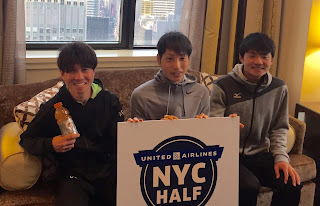 In New York with support from JRN and Komazawa coach Atsushi Fujita, the former Japanese marathon national record holder at 2:06:51, Nishiyama was a star runner at Iga Hakuho H.S. with a win on the First Stage at the 2012 National High School Ekiden Championships his senior year. He comes to New York off a strong junior year at Komazawa, winning the Fifth Stage at October's Izumo Ekiden and taking first in the university race at last month's Chiba X-Run cross country meet. Minatoya coach Hayashi Morozumi was the high school coach of Yuki Sato, the Nike Oregon Project's Suguru Osako, and other current top-level Japanese men before taking over at Tokai. Under his coaching Minatoya ran 13:54.07 for 5000 m, 28:46.59 for 10000 m and 1:02:54 in his half marathon debut in Ageo, the only Japanese first-year to clear 14 minutes, 29 minutes and 1:03:00 this year. With past Komazawa runners Kenta Murayama and Ikuto Yufu having run 1:02:02 and 1:02:50 in New York Nishiyama hopes to break 1:02:30. Minatoya, the first runner from Tokai to make it to New York, looks to end his first college season with a new PB. With possible snow forecast for the day a lot will depend on the weather. JRN will be on-hand to cover their performances. Watch live on ABC7 starting at 7:30 a.m. local time.